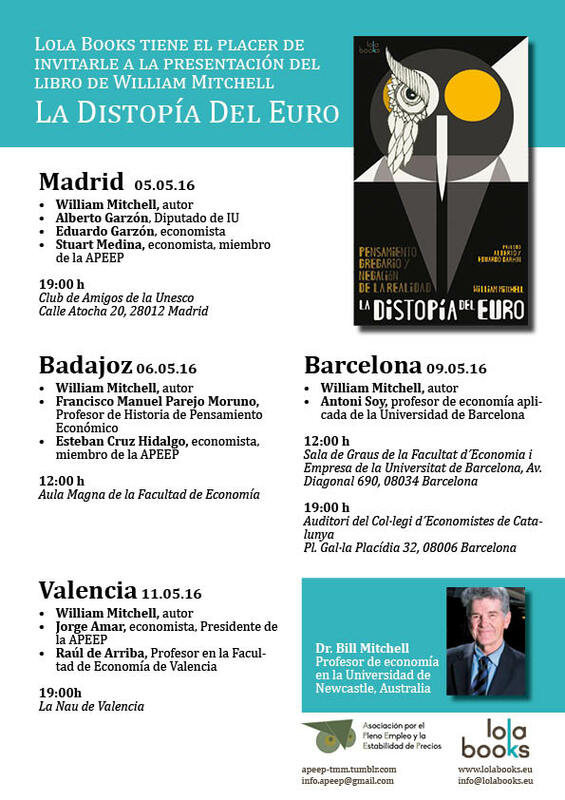 I am off to Spain in a few weeks to undertake a lecture tour associated with the publication of a Spanish translation of my current book – Eurozone Dystopia: Groupthink and Denial on a Grand Scale (see details below if you are interested). I noted by way of passing in a blog last week that a recent article in Spain’s highest-circulation newspaper El País (March 31, 2016) – Public deficit for 2015 comes in at 5.2%, exceeding gloomiest forecasts. The latest data shows that the Spanish government is in breach of Eurozone fiscal rules and is growing strongly as a result. Those who claim that Spain demonstrates how fiscal austerity can promote growth should examine the data more closely. The reality is that as growth has returned (albeit now moderating again), the discretionary fiscal deficit (that component of the final deficit that reflects the policy choices of government) has increased. Government consumption and investment spending has supported the return to growth, which had collapsed under the burdens of fiscal austerity between 2010 and 2013. Spain demonstrates how responsible counter-cyclical fiscal policy works. On February 18, 2009, the European Commission issued an – Excessive Deficit Report – citing Spain’s fiscal position under Article 104(3) of the Treaty. Article 104 of the Treaty lays down an excessive deficit procedure (EDP). This procedure is further specified in Council Regulation (EC) No 1467/97 “on speeding up and clarifying the implementation of the excessive deficit procedure”, which is part of the Stability and Growth Pact. According to Article 104(2) of the Treaty, the Commission has to monitor compliance with budgetary discipline on the basis of two criteria, namely: (a) whether the ratio of the planned or actual government deficit to gross domestic product (GDP) exceeds the reference value of 3% (unless either the ratio has declined substantially and continuously and reached a level that comes close to the reference value; or, alternatively, the excess over the reference value is only exceptional and temporary and the ratio remains close to the reference value); and (b) whether the ratio of government debt to GDP exceeds the reference value of 60% (unless the ratio is sufficiently diminishing and approaching the reference value at a satisfactory pace). So Spain was brought into the EDP by dint of its fiscal deficit exceeding the 3 per cent rule (its public debt ratio at the time was around 39.8 per cent of GDP – under the threshold). On April 27, 2009, the – European Council Decision – concluded that despite the “projected GDP contraction” of 2 per cent over 2009, the “the deficit criterion in the Treaty is not fulfilled” and as such “an excessive deficit exists in Spain”. For the next several years, the technocrats in the European Commission and in the Spanish government toiled away with reports and analysis – see Spain Ongoing procedure – for the enormity of this waste of resources and blind obediance to neo-liberal Groupthink. The European Council decision in April 2009 gave Spain until 2012 to “correct the excessive deficit”. A bit later (‘can down the road’) the Council revised the recommendation because of the “sharp deterioration in the growth outlook in the wake of the global economic and financial crisis had major negative budgetary implications” and extended the deadline for correction to the end of 2013. Then on July 10, 2012, the Council extended the deadline out to the end of 2014 given the “unexpected adverse economic events with major unfavourable consequences for government finances had occurred after the adoption of the Council Recommendation … In particular, a worsening in the growth outlook and the shift to a less tax-rich growth composition”. The “unexpected adverse economic events” were only unexpected by them. The situation in 2009 was fairly clear – it was going to be a very deep recession and the fiscal rules set by the mindless Maastricht Treaty would be blown out of the water by the cyclical impacts on government fiscal parameters alone. The – European economic forecast – Spring 2012 – that those targets were derived from were uniformly poor and understated the contraction in the Spanish economy. The Spring forecasts had Spain contracting by 1.3 per cent in 2012 and only 0.3 per cent in 2013. The reality was quite different. Spain contracted by 2.6 per cent in 2012 and 1.7 per cent in 2013 – quite some difference! The deterioration in the macroeconomic outlook is partly linked to additional consolidation measures included in the 2013-14 budget plan and the 2013 budget being taken into account. In other words, they got it wrong, imposed pro-cyclical fiscal cuts and the economy contracted by more than they had expected. Amazing really! They must live in a state of continual surprise in the EU towers in Brussels – they area always being confronted with “unexpected” occurrences. As day follows night, Blind Freddy could have predicted more accurately than the European Commission technocrats. For the many overseas readers, Blind Freddy is an Australian character (fictional) who is “supposed to have little or no perception”. As the Wiktionary tells us “what blind Freddy can see (understand) must be very obvious”. On October 1, 2013, the European Commission entered what it called the – Economic Partnership Programme – with Spain. It was more fluff from an organisation that excels in writing long reports (this one was 58 pages) that are based on some previous reports with dates and parameters altered a bit and lots of technical talk that amounts to nothing added. It continued to claim that “it was still necessary to maintain fiscal consolidation in order to continue on the path to reducing the public deficit” even thouse there remained an “adverse economic situation and uncertainty about the recovery of the European economy, which impacted the growth of the Spanish economy”. The new date for Spain to meet the fiscal rules was extended to 2016 and the ‘smoke and mirrors’ told us that pushing out the deadline from 2013 (in the first instance) to 2016 (the latest deadline) should not be seen as “a relaxation of consolidation efforts, given that the structural effort to be done is not less than that presented in the previous Stability Programme, and is even more for 2013”. Now the fiscal deficit targets were -5.8 per cent of GDP for 2014, -4.2 per cent by 2015, and -2.8 per cent of GDP by 2016 – thus complying with the fiscal rules under the stability and growth pact. At the time these targets were formulated the deficit was around 6.5 per cent of GDP. So a heap of austerity measures were outlined for Spain to follow, irrespective of the continuation of elevated levels of unemployment, particularly among Spain’s youth. At that time, Spain’s unemployment rate was 26.1 per cent and the youth (under 25 years) unemployment rate was 55.5 per cent. The European Commission was for the time happy that the austerity was sufficient. They said on November 15, 2013 that Spain had “taken effective action and that … no further steps in the excessive deficit procedure are needed at present”. We would wait until this year (2016) for the next assessment. 2016 was to be the new ‘witching hour’ for Spain – the year that they have to comply with the EDP or else. It will, of course, be or else, given that there wasn’t a ‘snowball’s chance in hell’ that Spain would comply with the rules. And on March 9, 2016, the European Commission spat the dummy again and in the report – Commission Recommendation regarding measures taken by Spain in order to ensure a timely correction of its excessive deficit – we learn that after considering “Spain’s 2016 draft budgetary plan”, the Commission concluded that Spain “was at risk of non-compliance with the provisions of the Stability and Growth Pact”. After further toing-and-froing between Madrid and Brussels with revised plans submitted and more time and energy wasted the Commission concluded that the fiscal deficit in Spain would “narrow to 3.6% of GDP in 2016, above the 3% of GDP reference value of the Treaty and the recommended deficit target of 2.8% of GDP. There are thus risks to the timely correction of the excessive deficit”. The Commission thus told Spain that it “should take measures to ensure a timely and durable correction of the excessive deficit, including by making full use as appropriate of the preventive and corrective tools set out in Spain’s Stability law to control for slippages at the sub- central government level from the respective deficit, debt and expenditure rule targets”. But the reality seems to be different and once again the Commission’s forecasts were again way off the mark and thank goodness for that. On March 31, 2016, the Instituto Nacional de Estadística (Spain’s National Statistics Institute) published the latest quarterly non-financial accounts for the institutional sectors and the data for the – General Government Sector – revealed a 56,608 million euro deficit for Spain’s government sector. That is equivalent to 5.2 per cent of GDP, much larger than the 4.2 per cent that the last deal with the European Commission stipulated (as above). Spain’s return to growth has been touted as a big success story for austerity. But if you examine the data in detail something different emerges. We know that Tax Receipts and Welfare Payments move inversely with respect to each other, with the latter rising when GDP growth falls and the former rises with GDP growth. These components of the fiscal balance are the so-called automatic stabilisers. In other words, without any discretionary policy changes, the final fiscal balance in any period will vary over the course of the business cycle. When the economy is weak – tax revenue falls and welfare payments rise and so the fiscal balance moves towards deficit (or an increasing deficit). When the economy is stronger – tax revenue rises and welfare payments fall and the fiscal balance becomes increasingly positive. Automatic stabilisers attenuate the amplitude in the economic cycle by expanding the budget in a recession and contracting it in a boom. So just because the fiscal balance goes into deficit doesn’t allow us to conclude that the government in question has suddenly become of an expansionary mind. The presence of automatic stabilisers make it hard to discern whether the fiscal policy stance (chosen by the government) is contractionary or expansionary at any particular point in time. To overcome this uncertainty, economists devised what used to be called the Full Employment or High Employment Budget. In more recent times, this concept is now called the Structural Balance. The change in nomenclature is very telling because it occurred over the period that neo-liberal governments began to abandon their commitments to maintaining full employment and instead decided to use unemployment as a policy tool to discipline inflation. Please read – Structural deficits – the great con job! – for more discussion about these decompositions. 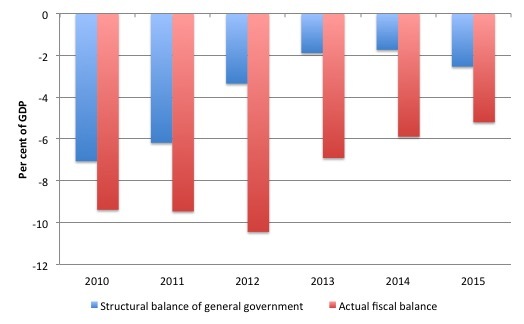 Now what do you think has been happening to the structural fiscal balance in Spain since 2013? For the austerity merchants to be able to claim that the recent real GDP growth in Spain has been the result of fiscal austerity, the structural balance would have to have fallen over this period. The data shows otherwise. The following graph taken from the European Commission’s own – Annual macro-economic database – shows the actual fiscal outcome (red) for Spain from 2010 and 2015 (adjusted for the latest data for 2015 and the Commission’s estimate of the structural balance (blue) both as a percent of GDP (potential GDP in the case of the structural balance). And remember that the European Commission’s estimate of the structural (or cyclically-adjusted) fiscal balance always errs on the side of too low – biased downwards – because it uses a flawed estimate of potential GDP. I explain that in the blog linked above. The data shows that the structural deficit (that is, the discretionary component of government fiscal policy) increased between 2013 and 2015. … as an example of “successful consolidation” even increased its structural deficit from 2013 to 2015 by 0.6 percentage points. As a consequence, in 2015 Spain was the advanced economy with the second largest budget deficit, behind Japan. Thus, the end of the recession in the Eurozone is not the result of “successful consolidation” but of a silent paradigm change which stopped the procyclical austerity policy of the years 2010 to 2013. And if you examine the latest National Accounts data from INE, real GDP growth resumed in the September-quarter 2013 and peaked in the June-quarter 2015, and has since then started to decline. 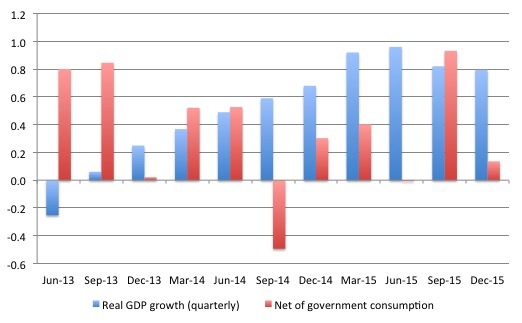 The following graph shows the quarterly percentage real GDP growth (blue columns) for Spain from the June-quarter 2013 to the December-quarter 2015 and the contribution of public consumption expenditure to that growth in percentage points. While real GDP is still 3.8 per cent below the peak in the June-quarter 2008, public spending has been an important part of the recovery process. Further, over that time (2013-2015), real public gross fixed capital formation (investment) has risen by 6.9 per cent after falling dramatically in the austerity years of 2010 to 2013. … part of last year’s gap is due to one-off expenditures in places such as Valencia or Catalonia – where €1.3 billion of previously unreported expenses surfaced in October – and to further undisclosed spending of €200 million by the city of Zaragoza on prison construction and on a tramway project. That is why the overall fiscal deficit has been falling but the structural deficit has been rising. An excellent example of counter-cyclical fiscal policy – the type that responsible governments pursue, irrespective of what the technocrats at the European Commission think. Once again the data tells the story. The Spanish authorities might have decided to defy the European Commission because of the pressures of an election year at all levels of government. That clearly led to some new spending initiatives and a slowdown in the sort of austerity cuts that Brussels desired. If the Spanish government now bows to pressure from Brussels to renew the austerity push, the expected result will be a further slowdown in real GDP growth in Spain. But then the technocrats in Brussels will put out another big report claiming that there had been an “unexpected” slowdown in growth. The poor souls – continually being caught out by these unexpected events that Blind Freddy could predict in his/her sleep. Are you a fluent Spanish speaker or is your presentation translated? Best wishes for your Spanish tour. I love how El Pais says “still” as though the increased economic growth is some random event of chance that has nothing to do with the increased deficits they spent the rest of the article bemoaning! They just don’t get it! And it considers itself to be a “centre-left” newspaper! You have probably already explained this I did try to find it having re read your “being trapped in a dysfunctional monetary system,” http://bilbo.economicoutlook.net/blog/?p=32265. But is deficit spending less wise in what is a foreign currency even though it will still have a stimulus effect? The Spanish would be better off deficit spending in their own sovereign currency. Is their present method of deficit spending in Euros doing what the neoliberals wrongly say about sovereign issue, that it builds up a debt that they cannot sustain? Never mind if you are not fluent in spanish. I will do my best to see and hear your presentation in Madrid on thursday 5th may at 19:00 in Atocha. I have read with interest several of your blog entries and this is a rare opportunity for me to see and hear you in person! I think it is important to bear in mind that 2015 was electoral year in Spain and this migth explain why the government(s) were not willing to reduce the deficit as mandated by the EU for electoral reasons. This is very telling if you are worried about the priorities of policymakers. Great article! It is obvious that the government was cynically increasing spending to win the elections which proves their poor ideological consistency. Thanks for that! The bad guys in Brussels, Dijsselbloem and Moscovici, are now pestering for new cuts in the order of 20 billion euro to achieve the impossible. Of course the 3% deficit limit is a moving target and cannot be achieved unless you want to see riots in the street. The more austerity you implement the further away it moves. Hopefully the new government will resist those demands but I am not confident that they will. The wishy-washy Socialist seem intent on not tredding outside the deficit reduction path and, without new elections in sight, politicians may decide to cave in and abide to pressure from Brussels. Fortunately political parties are having difficulty in forming a coalition and we might have to go to new elections in June, this means that a new government may not be in place at least until September, hardly enough time to make major cuts to satisfy Brussels and kill our weak recovery. The drawback is that now we do not have a government that can introduce discretionary increases in spending or tax reductions. Although I fail to see which political party would be willing to openly defy the EU. Industrial production indices show that the economy is slowing down again. In the meantime let’s not forgot that a large proportion of the population is suffering. Not only the youth but also many 45 to 65-year olds who have been out of work for two years or longer and have run out of unemployment benefits. Brussels inspired policies are about to impose “active” employment policies on these poor souls. Spain has now become Western Europe’s most unfair and unequal society showing that the recovery has only benefited a privileged part of the population. Wages and salaries have plummeted. More fiscal expansion is required! El País is now technically bankrupt and has been so for about a decade. It now belongs to the banks and some sinister investment fund. It is far from being center-left and it is campaigning for the replacement of the corrupt PP, Cidudanos, a center-right party with a radical neoliberal agenda. As is often the case I find it hard to distinguish between your explanation of the Neo-liberal argument and what you believe to be true, ie the MMT position. However it does seem common for you to discuss fiscal balances (deficits), structural balances, pro-cyclical spending and other quantities that my reading of MMT to suggest were dependent variables given the constraints applied to the economy. Consider a piston moving in a gas filled cylinder. As the piston advances into the cylinder, the temperature of the gas will rise and as the piston retreats, the temperature of the gas will drop according to Boyle’s law. Although heat is a relevant quantity here, you will never come to an understanding of this system simply by looking at heat budgets. You can divide your heat flows according to any sophisticated criteria you care to devise. However, the temperature changes are caused by the pistol moving, thinking about heat flows just confuses the issue. In the case of the fiscal balance, the ‘piston’ is the savings propensity of the private sector. Sophisticated classifications of government fiscal flows are only confusing the situation. Your government can be as pro-cyclical or counter-cyclical as it wants. It can have a structural deficit or surplus. It can raise spending or drop it. It can raise tax rates, cut tax rates, target the rich or the poor. As long as the private sector has the option to net save, then the private propensity to save will be the determining factor in the sign of the fiscal balance. This is why Neo-liberal economists are continually surprised by fiscal balance results, they are looking at the wrong variables. Still, you also seem to lend some credence to the practice of looking at these government fiscal settings variables when considering the fiscal balance. When EMU countries deficit spend they have to get the Euros from somewhere, do they have to borrow? Does the ECB issue any currency to EMU nations interest free?